Anthony Davis is a self-taught artist known mostly for his award-winning maritime scenes and seascapes in pastel and oil. He is a Signature Member of the American Society of Marine Artists (ASMA); an Artist Member of the Salmagundi Club and a Member of the Lyme Art Association. His seascape-themed artwork has gained national recognition in museum exhibits across the country, particularly in ASMA’s National and Regional exhibitions. He was chosen for the Heckscher Museum of Art’s first Biennial Exhibition in 2010, featuring Long Island artists, and his work was featured on the cover of Pastel Journal and International Magazine. 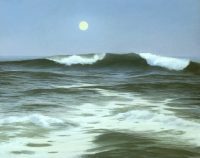 In 2014 his painting titled “From Here to Eternity” was awarded the Gold Medal for Pastel at The Salmagundi Club’s Annual Members show and in the same year was chosen for The Pastel Journal’s Annual Pastel 100, the top 100 pastels of the year. Anthony has taught his approach to seascape painting and given numerous demonstrations across the country. He also enjoys painting outdoors in oil, and as a plein air painter he is a founding member of The Long Island Plein Air Painters Society and responsible for the creation of Northport’s first Plein Air Painting Event, on Long Island. Anthony is represented by numerous galleries on Long Island, New York and in Connecticut. When not painting, he has been a practicing Physical Therapist for 24 years and is currently in the midst of writing his first novel.